Analysis of North American grizzly bear distribution since 1900 reveals that populations exposed to intense human settlements and industrial pressure have survived only when they are found in large public land ecosystems of which 50% or more is roadless and managed as Wilderness or National Park. Grizzlies once ranged across most of western North America. From Mexico to the sub arctic, the apex predator was the grizzly bear. Tweet This! Despite this knowledge, grizzly populations and habitat loss across BC are following the same path as much of the lower American states. There are now eleven ‘threatened’ grizzly bear population units in BC and one quarter of the province is either without grizzlies (8%) or occupied by threatened populations (16%). 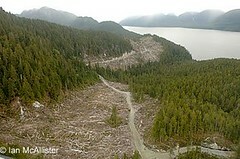 Until very recently, inaccessibility protected BC’s central coast from the large-scale industrial logging that has severely altered landscapes in adjacent southeast Alaska, other parts of BC, and the Pacific Northwest. Because of this remoteness, the original biota has remained largely intact and natural ecological and evolutionary processes on the central coast operate much as they have throughout recent history. Logging roads affects grizzly bears in various ways. They can be temporarily or permanently displaced from habitats near roads and they enable hunters, poachers and conflicts with humans. Ecological assessments indicate that for each kilometer of road, ten hectares of habitat is fragmented, impacting the continuity and quality of that habitat. Coastal grizzlies also have to contend with habitat fragmentation caused by helicopters and jet boats on rivers, which disrupts feeding patterns and causes dislocation. 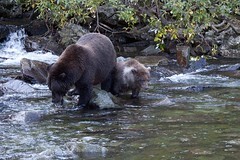 Although a female grizzly’s home range may be limited to one or two river valleys, males require large clusters of interconnected watersheds. Coastal grizzlies rely on intact forests for denning and bedding sites, thermal cover and security. But most importantly they need intact river valleys for their diverse food supply of plants, berries and salmon. Coastal grizzlies rely on intact river valleys for food and denning. In 2001, the BC government announced protection for 20 watersheds within the Great Bear Rainforest. This represented about 19% of the region’s landbase and increased protection to roughly 25% of the landscape. This decision reflects, in large part, years of work by Raincoast and was an important step toward protection. This was only a step however, because the protected areas were generally isolated, lacked the contiguous protection needed for far-ranging carnivores, failed to protect salmon habitat, and ignored the region’s fragile, archipelago nature. In 2006, a second agreement was announced that added another 5% protection, a marginal increase from the 2001 plan. Central to this decision was the adoption of the term Ecosystem Based Management (EBM) for the remaining 68% of the landscape. The plan was developed by the Rainforest Solutions Project (RSP) and the forest companies, and later modified by First Nations. While the theory behind EBM identifies the need for ‘sustainable’ resource use, the concept itself has never been successfully demonstrated in an industrial forestry setting. In fact, despite its adoption by the US Forest Service, the concept was abandoned in 2004 because it is undefined and never delivered on the promise of improved management and conservation. 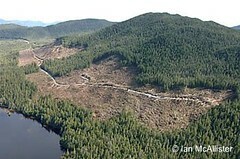 Logging roads and clearcuts began on previously unlogged Banks Island in 2006. Because the GBR has low levels of protection, future logging under EBM will likely lead to impacts on species of concern. Under EBM, which will apply to 68% of the GBR, the total harvest of trees (AAC) will increase, logging up to 50% of a given watershed is allowed, only 15% tree retention is required in cut blocks, and minimal (1 and ½ tree length) buffers are given to salmon streams. Raincoast does not believe this represents an innovative or progressive model for land use and, while we want to believe, we anticipate that conventional clearcut logging will be the norm. We fear this plan, chosen as an alternative to higher levels of protection, will not deliver on the promise of sustainability. While decisions made by governments are inherently political, decision-makers must understand the importance of using science if their decisions are touted as solutions to conservation problems. The level of protection for the GBR fell far short of recommendations from the team of scientists informing the land use process. The science team recommended upwards of 70% protection to safeguard biodiversity and identified anything below 40% as a “high risk to biodiversity”. This might be acceptable from a political perspective, but it is erroneous to label it as ‘protection’. Characterizing the land use plans for the GBR as a solution to ecological and sustainability problems does a further disservice, as it makes it easier for governments to close the door on future conservation options. Raincoast’s guiding philosophy is that ecosystem sustainability should supersede political expediency, as ultimately an unsustainable ecological strategy only leads to unsustainable economic and social systems. Our strategy is to use science and conservation biology as the drivers of decision-making. For biodiversity in rare ecosystems, this requires specific set asides of land that have been designed to protect umbrella or apex species. There is no ambiguity about the level of protection and kind of activities allowed in areas whose highest use is to provide habitat for key wildlife species. With over 16,000 species at risk and 80% of primary forests degraded or destroyed globally, Raincoast believes that a science based approach is required if we are to truly protect the Earth’s last large intact network of coastal temperate rainforest.